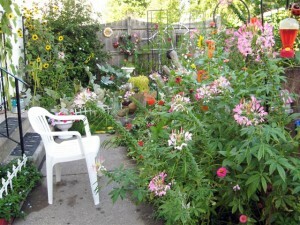 Buffalo-NiagaraGardening.com > Garden tips > It’s autumn, and this Amherst garden is still blooming! It’s autumn, and this Amherst garden is still blooming! Ann and her husband Jack have lived in the duplex at 136 Fairgreen Dr., Amherst, since 2004. They have been adding to the backyard garden there every year. 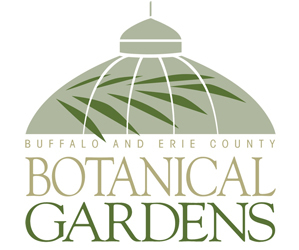 Many of their plants are perennials, which are still blooming. Ann enjoys the zinnias because they come in so many colors and unusual varieties. 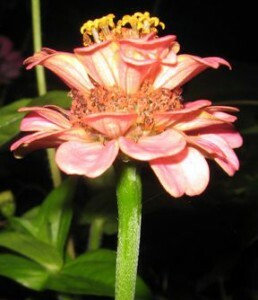 At right you can see a zinnia with a double flower. Her morning glories and rose of Sharon are still blooming, though they don’t have as many flowers now as they did before. 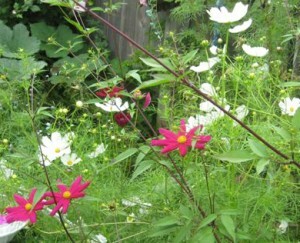 The cosmos, which you can see in Ann’s photo at left, flopped over a bit in the recent rain, so Ann tied it up. “But it’s still blooming,” she said. Ann said she planted her cleome seeds densely because she wanted a full garden, but that was a mistake because they didn’t grow well. The plants are taller and healthier if you plant the seeds further apart, she found. That tip works with zinnias, too, she added. Cleome reseeds readily. If you want cleome seed to get started, Ann said she would share her seeds. Contact Ann at pawsndolls@roadrunner.com. Tip for bird lovers: Mourning doves like cleome seed, Ann said. Another flower that is still blooming is a Mexican sunflower, which she planted from seed. 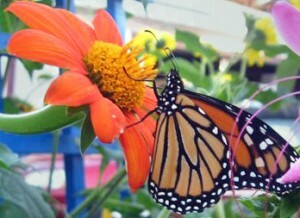 It’s a tall plant that attracts monarch butterflies, which you can see above right. 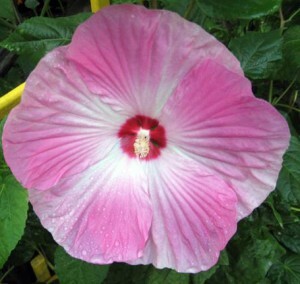 This past Wednesday as she left for work, Ann got an autumn treat: an outburst of blooms on her hibiscus. The flowers, which you can see in the photo at left, are a gorgeous pink and are as big as dinner plates. “I didn’t think this was going to happen any more this year,” she said. 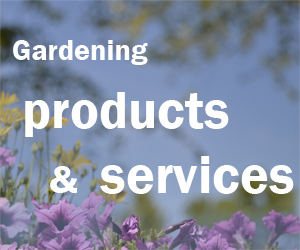 Ann enjoys feeding the birds and squirrels, and that has led to some surprises in her garden. She has a group of sunflowers that she didn’t plant– the squirrels must have buried some bird seed. “I call it my squirrels’ garden,” she said. There’s also a delightful patch of corn grown from bird seed, though the stalks didn’t get any ears. Then there’s the pumpkin. Ann was mystified as to how the plant found its way into her garden, but it was probably planted by squirrels as well. After Halloween last year, Ann retrieved discarded pumpkins, cut off the tops and let the squirrels enjoy them. 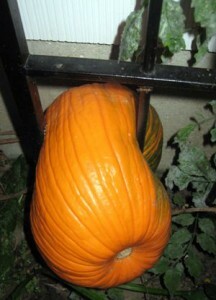 The pumpkin developed in an unusual spot– between two posts of a trellis, which you can see in the photo at right. Ann will leave the pumpkin in place and allow the squirrels to eat it. 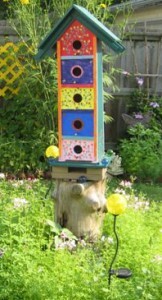 Jack makes bird houses, such as the one at left, and Ann enjoys painting them. This one is set atop a tree stump they got from friends after the October Storm of 2006. The stumps also make great bases for potted flowers, Ann said. Another thing the couple got after the October Storm was a dead 20-foot-tall tree that they dragged home with their car. They dug a deep hole, placed the tree in the hole and added stones and concrete to keep it from falling over. 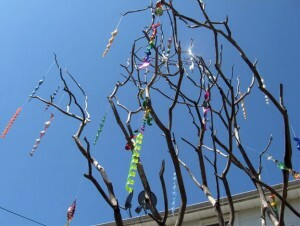 They hang twirlies from the tree, which you can see in Ann’s photo at right. What a beautiful Garden! God does give us so much. How wonderfully put together Your garden is to have so many blooms & such color yet. This Morning I was thinking of All God has done for me & seeing this article & pictures just added to His Glory. Congratulations! It’s a beautiful garden. Thank you all for your encouraging comments. It is a great garden. It’s nice to be reminded that we have so much blooming beauty in Buffalo in October.